With the Dialogue P-300 Photo Phone you can call friends and family with a touch of a photo. Simply insert photos into the 9 memory frames and program the numbers into the phone's memory. If you need amplification, press the AMPLIFY button for 20dB gain. 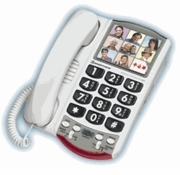 A great phone for people with low vision or memory difficulties. Adjustable volume up to 10 (20+dB) times standard sound level for people with mild to moderate hearing loss Adjustable tone selector clarifies hard to distinguish sounds like "chair" and "share"